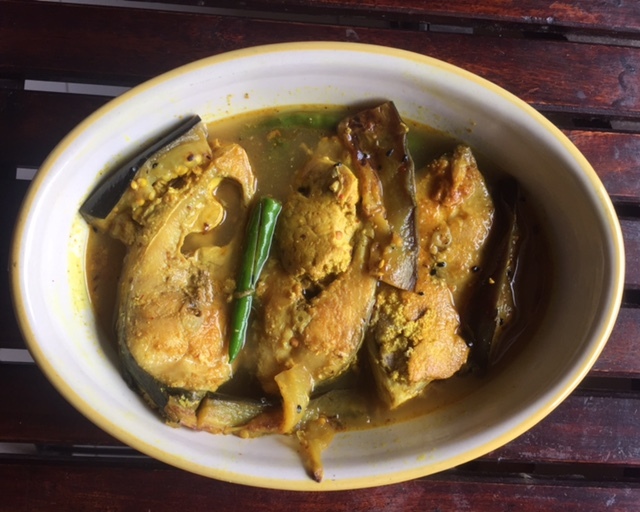 This post is about an ilish maachher jhol recipe that I picked up my from my maternal grandmother during my recent trip to Kolkata and which I am going to share with you here. It is a light fish curry made with the much loved hilsa fish. While we refer to this curry as 'jhol' in our family, I have seen some Bengalis on social media refer to it as as 'tel jhol' too. Unlike in most curries from the western coast of India, this curry from undivided Bengal is not coconut based. In case you have were wondering about the Game of Thrones, 'a girl has no name', reference in the heading, this post also looks at the curious case of my grandmother's 'birthday' which was celebrated a couple of days back. Why the italics around birthday you ask? Well, birth certificates were apparently not the norm in Bengal at the time when my granny was born I am told and birth dates were rarely recorded back then. I am talking of the 1920s. A birth date was often arbitrarily decided by the school teacher when a child went to school or, in my granny’s case, by her husband for post marriage red tape requirements. 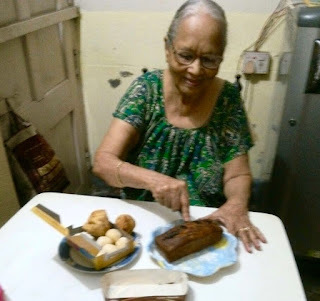 A few years years back, my bother and my first cousin, who were then kids still living in Kolkata, decided that didu (as we call my grandmother) should have a 'proper' birthday. They chose a date in March, bought her gifts with their very meagre pocket money then and celebrated didu's 'first birthday' when she was close to 80. The two cousins have grown up since then and have both moved out of Kolkata. Both have recently given didu a great granddaughter each as a gift and have made her very happy. Earlier this year, my aunt who lives in Dubai, was in Kolkata in March and helped didu celebrate her grandchildren given birthday. The birthday that I am talking abut here and which was celebrated a couple of days back was the one which my late grandfather had given her. He had done so for didu's bank and pension paper requirements. When I called her to wish her on the day, Didu wryly told me that dadu (my grandpa) had advanced her age by a few months when he assigned a birthday to her and made her 'older' than what she was. "He could have reduced my age, but no that he wouldn't do that,"said didu with a huff. 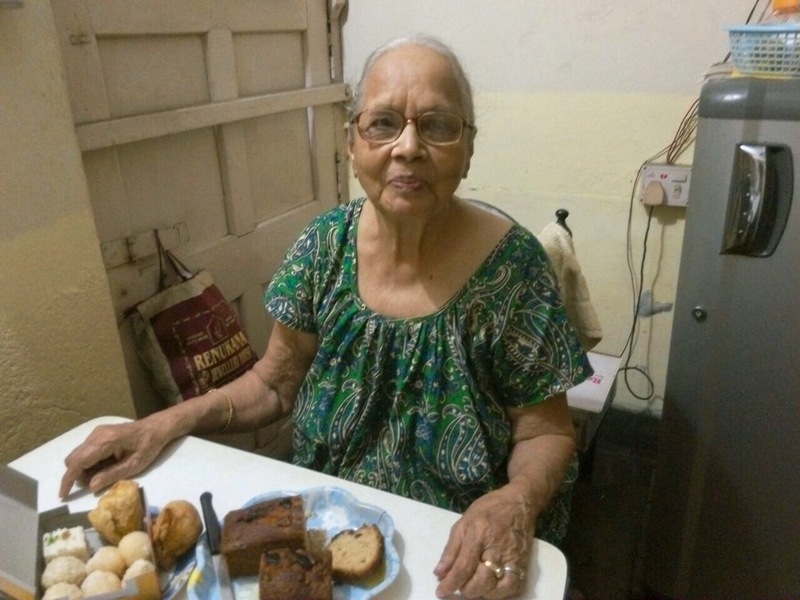 According to the official records, didu turned 90 a couple of days back. She would argue that she has a few more months till she hits 90 but that but then which woman is ever happy to disclose her age? 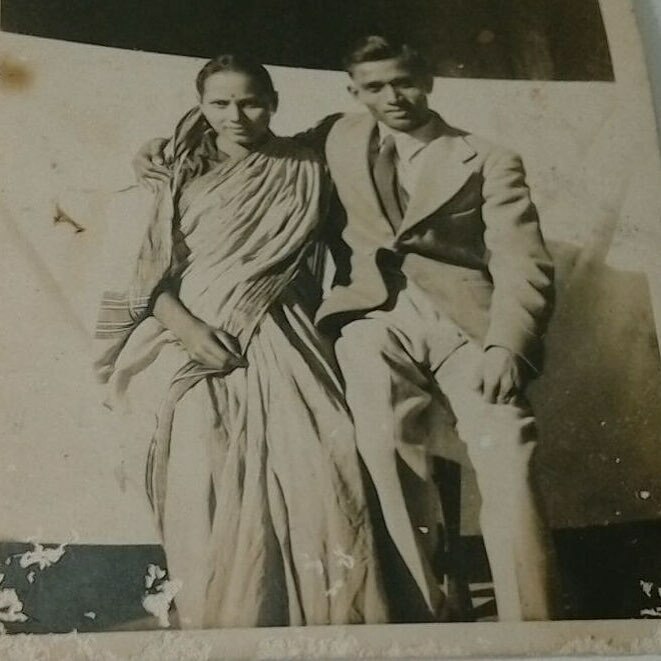 "I don't even remember the date on which I had got married," said didu. I could hear a bashful giggle in her voice through the phone lines when she referred to her marriage. "In those days it was enough that we had got married. We didn't celebrate anniversaries and all like you people." My mother is in Kolkata right now. She helped didu celebrate her 'husband declared birthday' and then sent us pictures of the same. Mom went to the local Spencer’s store and bought sweets and a date and walnut cake and then shingaras from the local sweet shop for the 'party.' The other guests were the house help. My aunt and her husband who live in Kolkata couldn't make it because of the rains that day. My brother called didu from Gurgaon later that evening to wish her. He told us that she sounded very excited on the phone and said that no-one had ever cut a cake on her birthday before this. Life begins at ninety you could say. Birthday tales over, let's go back to my lunch with didu from a few weeks when I had gone to visit her in Kolkata. She cooked a gala lunch for me for me the day before I left. We had a nice chat over lunch that afternoon while I gobbled up the delicious food that she had dished out. "You should just add minimal spices to ilish so that the flavour of the fish is not masked. Not onion or garlic or lot of spices," explained didu. "There was a lot of ilish around where I grew up in Dhaka. They would do shorshe bhaapa (steamed in mustard) ilish in our house only if the fish was not fresh," said didu in full Marco Pierre White 'respect your ingredients' mode. Less is more is not just a western culinary concept. It is revered in Bengal too. The only time I came across hilsa cooked with onions myself was when I went to Dhaka in the late 1990s for a market research project. I was flummoxed by it too! I had never eaten hilsa cooked in onions till that day and never after that either. When I mentioned this on Instagram, a Hindu lady from Bangladesh wrote in saying that cooking ilish in onion was not that uncommon for them. I specified the ‘Hindu’ bit as I had at one time wondered whether the addition of onion was a Mughal influenced Muslim custom. I would love to know more about that so do write in if you have some information on this and I would to add it to the post. While writing this, I got a message from my friend Kaniska Chakraborty who is Dhaka right now. He wrote: "had an ilish dopiaza and pulao for lunch today. Oddly satisfying." When I told him that I am writing a post on ilish and onion, he replied, "ah yes, the thing that makes West Bengal cringe and Bangladesh salivate." Over the years I have realised that Bengali cooking is so nuanced that I find it funny and even farcical when people get possessive about Bengali food and the way it should be cooked. Which is usally theri way of course! There are of course a variety of ways in which ilish is treated from house to house. Many don't shallow fry the fish for example before putting it into curry unlike what is done for fish like rohu or kaatla in Bengali houses. The tradition of not frying the ilish first seems to stem from a time in Bangladesh when the lilish available was very fresh and needed just the lightest touch in the kitchen to make them ready for meal. In our house however, the practise from ever since I remember has been to shallow fry the hilsa before adding it to curries. I asked didu for her recipe for the curry while we had lunch. She told me in the ‘bold brush strokes’ manner that people in her generation use. The fish curry that my mother would make us when we were kids was similar to to the one didu makes. The other ilish curry that my mother would make was a watery crushed mustard seed gravy. We didn’t have a variety of ilish dishes made at our place. Didu said that in her childhood days, ilish was so abundant when in season that they would do a shorshe bhaapa (mustard steamed) ilish only when the fish was not at its freshest. The mustard helped mask this. Ironically, shorshe bhaapa was one of the first ilish dishes that I made in my kitchen and felt excited then about going beyond what I then considered the ‘boring’ menu at home. The maturity of age has taught me that there was a lot of thought and history behind what happened in our kitchen. As I had mentioned earlier, my mother in in Kolkata with my granny right now. She is back to her pet project of talking to didu about her (didu's) childhood and then documenting these on her (my mother's) blog. 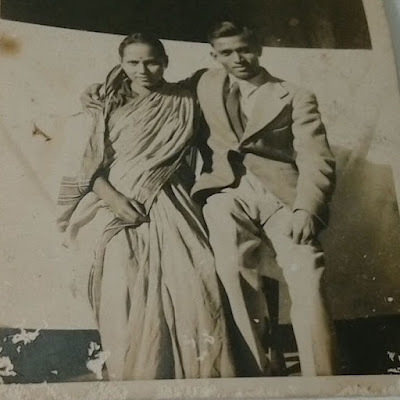 This precious narrative of my family's oral history is also a fascinating read about life in period around 1930 - 1945 s in Dhaka in undivided Bengal and in what is now Bangladesh. I have posted a few of the links at the end of the post. I felt a bit sad when I read my mother’s blog post about the hilsa bounty during my granny’s childhood days in Dhaka. Ilish today is so expensive. A slightly biggish one (850 g) was Rs 1200 a kilo in our Bansdroni market in Kolkata. Folks like my granny and my mother can’t think of buying ilish at these prices. I bought an ilish for my granny when I was in Kolkata. Didu scolded me for spending so much and then proceeded to cook the ilish for me! She gave me the peti stomach pieces, which has fewer bones, and kept the bonier gaada pieces for herself as she knows that I can’t handle fish bones well. That’s what #GrannyLove is all about. I tried to recreate didu's ilisher tel jhol after I returned to Mumbai and bought ilish at the Khar fish market. Didu adds brinjal to the curry and so did I. Some people on Facebook, whose families originate from erstwhile East Bengal, said that they make a similar curry but add pumpkin to it. Interestingly, no-one said that they add potatoes to the curry which was strange given that Bengalis, including didu, add potatoes to everything. I didn't cook the curry too badly I'd like to think, though it was not didu level of course. Over the years I have realised that it is not just the Bengalis who live ilish. In Mumbai, Parsis eat ilish too. My late father in law was a fan of ilish I am told. They get a seawater of hilsa variety from Gujarat here and the Parsis call it bheeng. My father in law loved the ilish roe or garab too. Unlike in my mom's kitchen, where the ilish roe is kept in the fish when cooked, Parsis take out the roe and cook it separately. Zinobia Schroff makes and retails a delightful hilsa or bheeng roe pickle which is called garab nu achar. My mother told me that Bengalis take the roe out and cook it only if it is too much in quantity and added that she is not a fan of this. Chef Vicky Ratnani tells me that the Sindhi community, to which he belongs reveres the hilsa too. They call it pallo and it is apparently considered to be the vehicle of their main God, Jhulelal, just as the lion is for the Goddess Durga in the east. I am very keen to try out how the Sindhis and Parsis prepare hilsa. Last evening I was in the company of two Parsi ladies. One 91 years old and another 83 years old. They regaled us with the stories of their community. Some licentious enough to make it to Game of Thrones sub-plots! They told me that Parsis in Mumbai in the 1920s would get their birth certificates done and that they, unlike my granny, knew their birthdates. This didn't apply to their previous generation though and their parents didn't have birth certificates either. "There was no need for it then." It's another matter that the Parsis that I know prefer to celebrate their birthday according to the Parsi religious calendar and not the 'English' one which the birth certificate refers too. couple forget their reserve and cosy up for a picture? Here's a step by step pictorial depiction of the recipe. Heat mustard oil in a pan. Add kalo jeere (nigella seeds) and green chillies. You can use the same pan in which the fish was fried so the oil used in frying the fish is not wasted. This will add to the final flavour of the dish. Gently slide in the fish ( 4 pieces) in the boiling water. Make sure that they don't break. Reduce the flame after 30 seconds, gently turn the fish over. Add the brinjal. Once shallow fried, the brinjal cooks pretty fast in water so it makes sense to add it later. Let it cook for a minute or so and you are done. You don't want to overcook the fish. It's a long post so please message me if you see typos/ errors and please join me in wishing my granny a happy birthday.